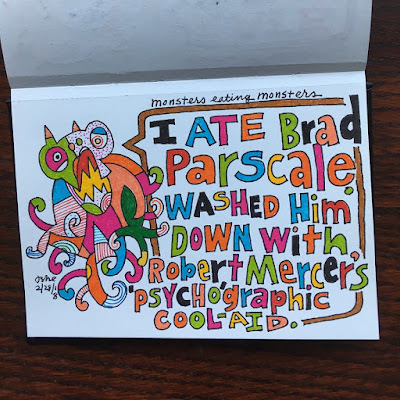 I ate Brad Parscale. 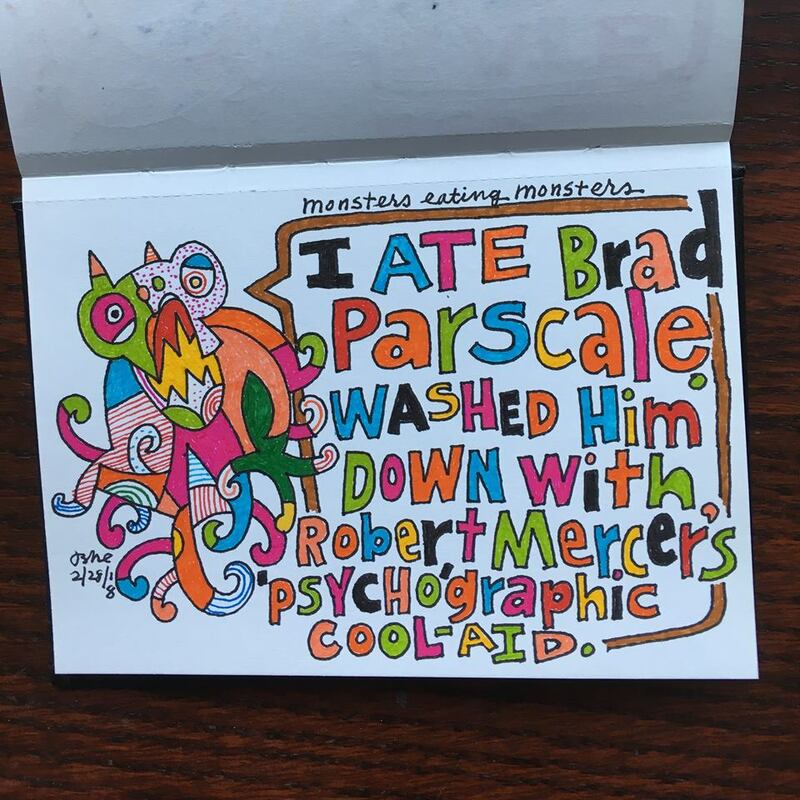 Washed him down with Roberti Mercer's 'psycho'graphic cool-aid. "... Cambridge Analytica’s rise has rattled some of President Trump’s critics and privacy advocates, who warn of a blizzard of high-tech, Facebook-optimized propaganda aimed at the American public, controlled by the people behind the alt-right hub Breitbart News. Cambridge is principally owned by the billionaire Robert Mercer, a Trump backer and investor in Breitbart. Stephen K. Bannon, the former Breitbart chairman who is Mr. Trump’s senior White House counselor, served until last summer as vice president of Cambridge’s board. ..."
"... The president's son-in-law and senior adviser, Jared Kushner, said in a statement: "Brad was essential in bringing a disciplined technology and data-driven approach to how the 2016 campaign was run. ..."
I ate Xi Jinping, Putin, el-Sisi and Erdogan. Now drunk on power. "... 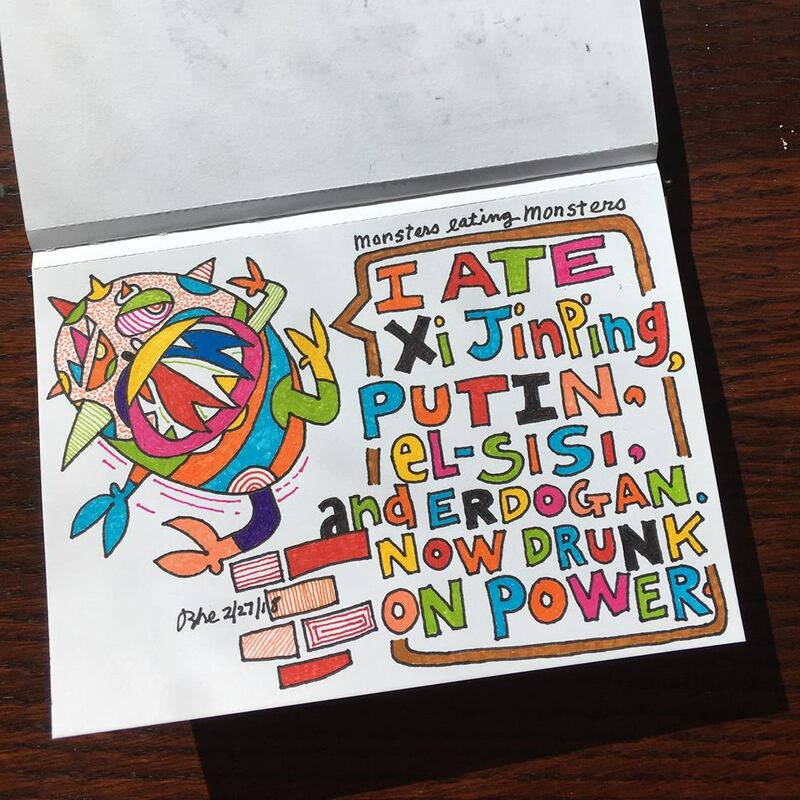 The list includes Vladimir V. Putin of Russia, Abdel Fattah el-Sisi of Egypt and Recep Tayyip Erdogan of Turkey, all of whom have abandoned most pretenses that they rule according to the people’s will. Authoritarianism is also reappearing in places like Hungary and Poland that barely a quarter century ago shook loose the shackles of Soviet oppression. ..."
I ate Ryan Zinke. Now sick on a meal of oil, gas and coal but expensed it. "... Usually, there’s a tension between the department’s mandates—to protect the nation’s natural resources and to manage them for commercial use. Under Zinke, the only question, from the redwood forests to the Gulf Stream waters, is how fast these resources can be auctioned off. ..."
"... 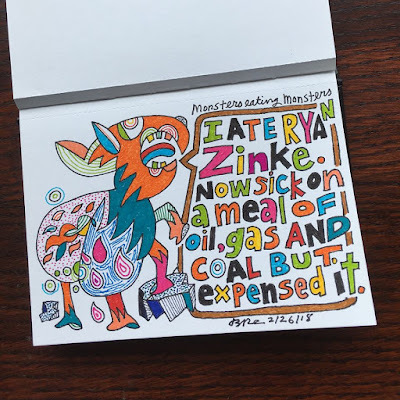 Interior Secretary Ryan Zinke wants to get rid of our national parks to make way for more oil and mining — and he's spending taxpayer money while he's at it ... ..."
I ate Myanmar. 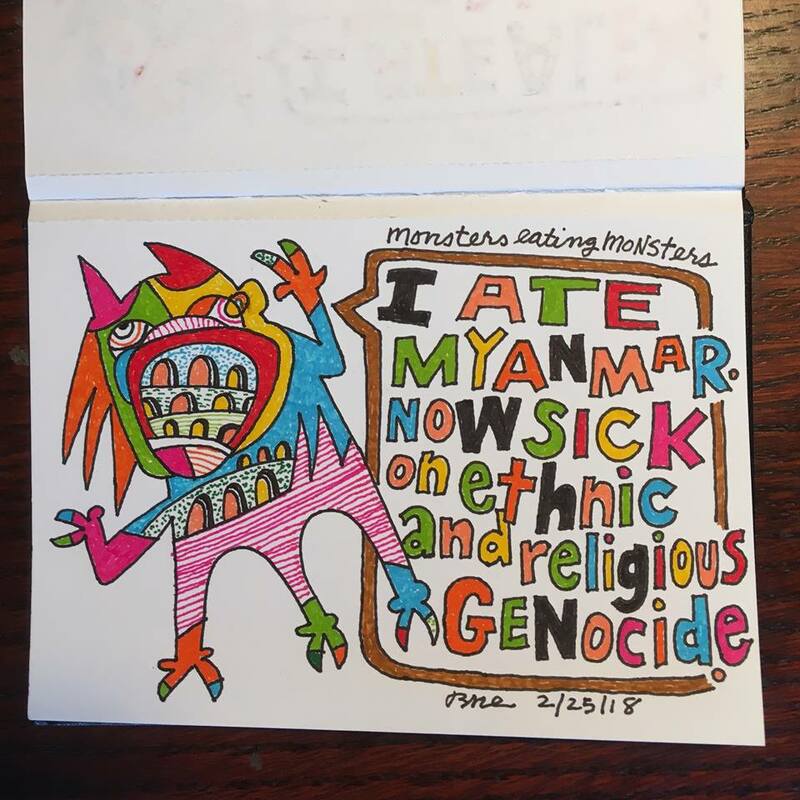 Now sick on ethnic and religious genocide. "... The graves are the newest piece of evidence of what looks increasingly like a genocide in Myanmar's western Rakhine state against the Rohingya, a long-persecuted ethnic Muslim minority in the predominantly Buddhist country formerly known as Burma. ..."
"... However, the AP's reporting shows a systematic slaughter of Rohingya Muslim civilians by the military, with help from Buddhist neighbors - and suggests many more graves hold many more people. ..."
"... While Myanmar's government claims it's simply trying to rebuild a devastated region, the operation has raised deep concern among human rights advocates, who say the government is destroying what amounts to scores of crime scenes before any credible investigation takes place. 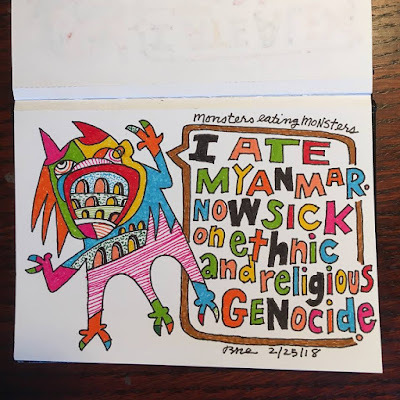 The operation has also horrified the Rohingya, who believe the government is intentionally eviscerating the dwindling remnants of their culture to make it nearly impossible for them to return. 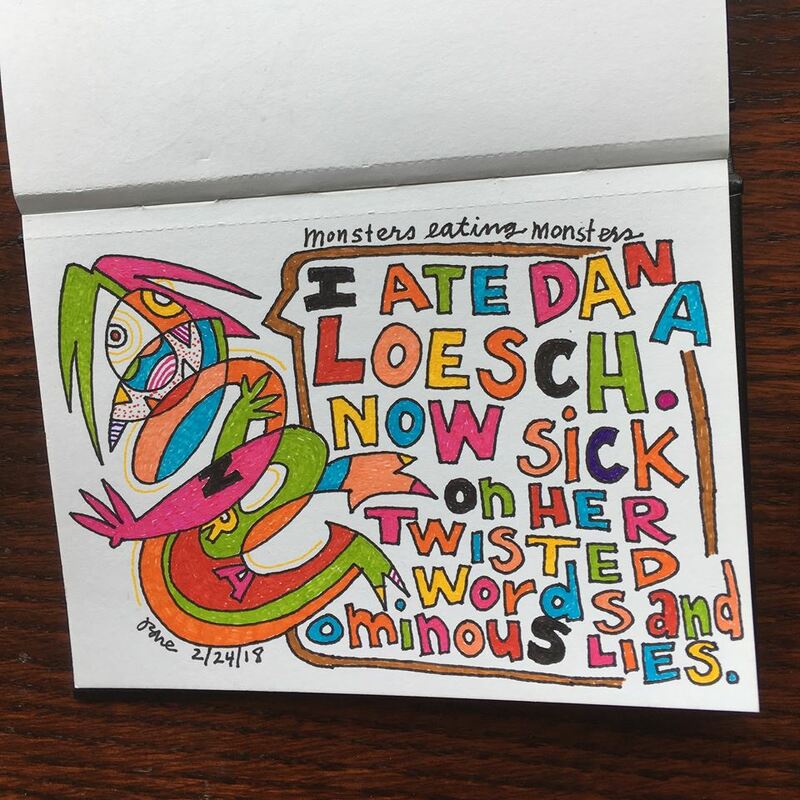 ..."
I ate Dana Loesch. Now sick on her twisted words and ominous lies. "... Watch this recently released ad from the National Rifle Association, starring right-wing pundit Dana Loesch. It comes this close to calling for a civil war against liberals... "
I ate Alex Jones. 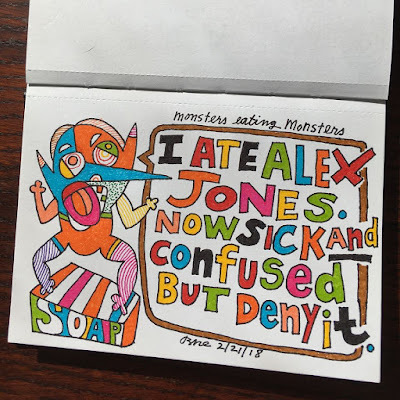 Now sick and confused but deny it. "... Jones has been the center of many controversies, including his promotion of Sandy Hook Elementary School shooting conspiracy theories, and his opposition to gun control. He has accused the U.S. government of being involved in the Oklahoma City bombing, the September 11 attacks, and the filming of fake Moon landings to hide NASA's secret technology. ..."
"... In June 2017, journalist Bill Moyers claimed that Trump and Jones explicitly "operate as a tag team". ..."
I ate the NRA. 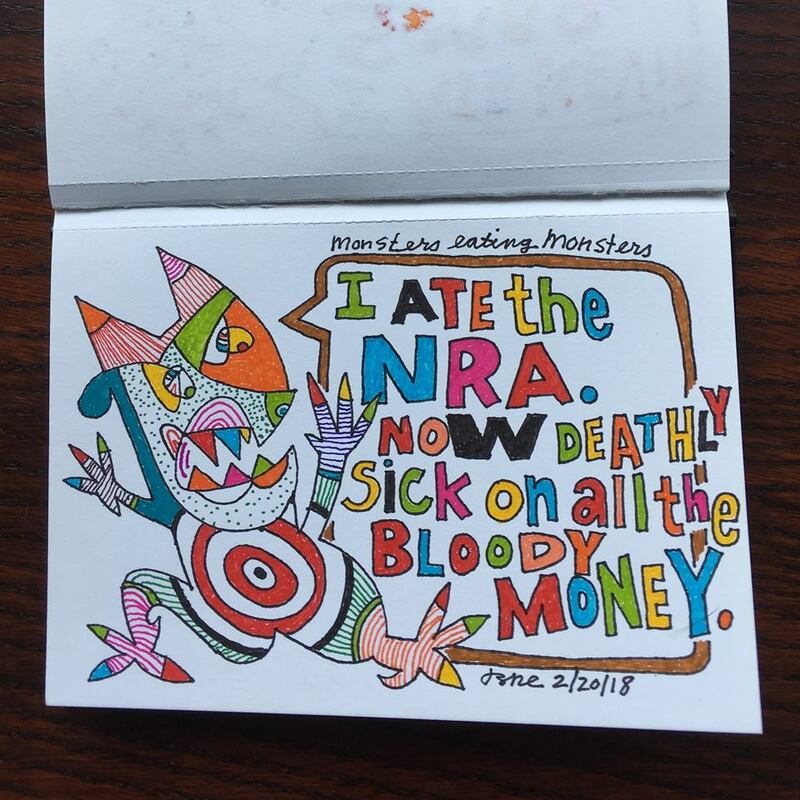 Now deathly sick on all the bloody money. "... “If they accept this blood money, they are against the children,” Emma Gonzalez said on CNN’s “New Day” on Monday. “You’re either funding the killers, or you’re standing with the children.” ..."
Don't let Trump/NRA/GOP #deflectdistractdiscredit you! 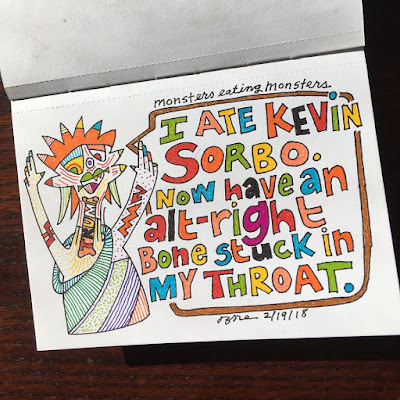 I ate Kevin Sorbo. Now have an alt-right bone stuck in my throat. 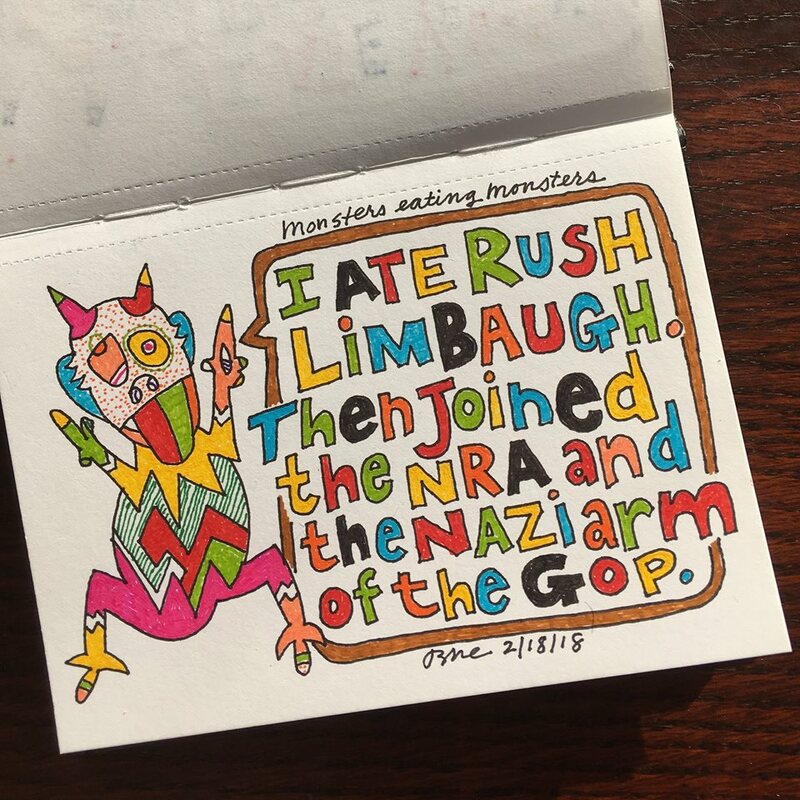 I ate Rush Limbaugh. 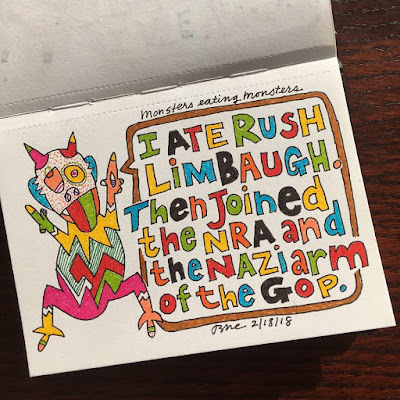 Then joined the NRA and Nazi arm of the GOP. "... “The solution is we need concealed carry in these schools,” Limbaugh... on “Fox... ...have suggested that if school officials or students were armed, casualties during mass shootings could be reduced. 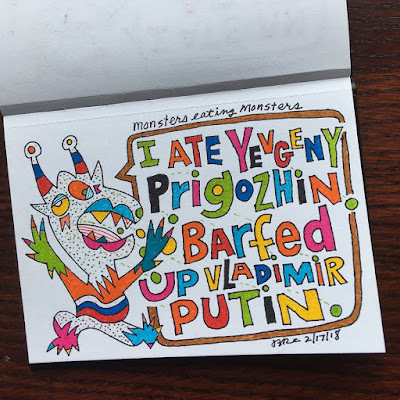 ..."
I ate Yevgeny Prigozhin. 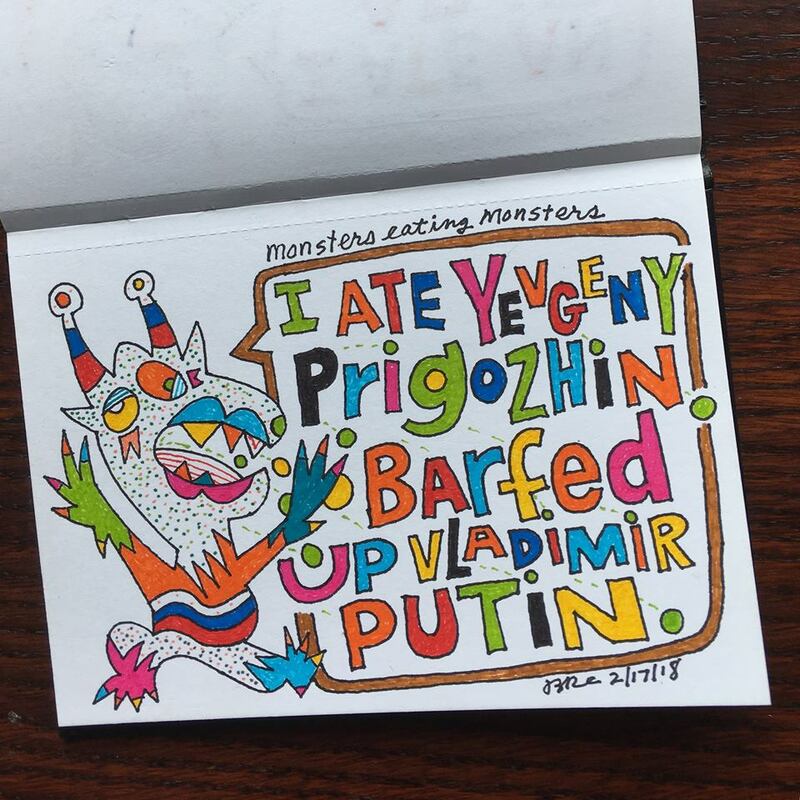 Barfed up Vladimir Putin. "... Despite his humble, troubled youth, Mr. Prigozhin became one of Russia’s richest men, joining a charmed circle whose members often share one particular attribute: their proximity to President Vladimir V. Putin. The small club of loyalists who gain Mr. Putin’s trust often feast, as Mr. Prigozhin has, on enormous state contracts. In return, they are expected to provide other, darker services to the Kremlin as needed. 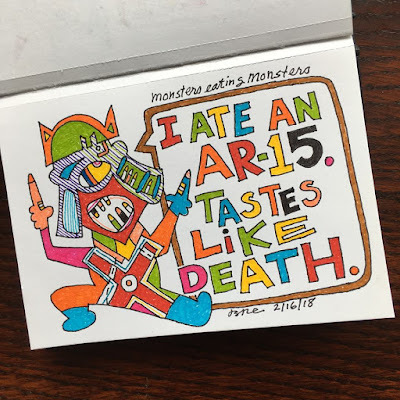 ..."
I ate an AR-15. Tastes like death. "... The NRA dubbed it "America's rifle." ..."
"... The AR-15 has come to carry connotations of heroism (a Remington ad said it gives "you the confidence and firepower to get the job done"), political resistance (tighter regulations could let government "subjugate Americans" and make them "live under tyranny," a National Rifle Association executive said), fun ("killin' zombies before it was cool," reads another ad) and mass murder (high-capacity magazines have been used in more than half of mass shootings over four decades, according to several studies). ..."
"...But the AR-15 found new life in 2004, when President George W. Bush scrapped the ban on assault weapons that had been enacted under President Bill Clinton in 1994. And in 2005, Bush signed into law a measure protecting arms makers and dealers from liability for crimes committed with their products. The NRA called it "the most significant piece of pro-gun legislation in 20 years." ..."
"... A Pew poll last year found that 68 percent of Americans favor banning assault weapons, including 48 percent of gun owners. ..."
"... The latest school shooting led some pro-gun politicians to speak out against the AR-15. "I have hunted all my life," Sen. Bill Nelson, D-Fla., said on the Senate floor Thursday. "But an AR-15 is not for hunting. It's for killing." Nelson, up for reelection this year, is expected to face Gov. Rick Scott, a Republican who got an A+ ranking from the NRA. Scott said Thursday that he supports keeping guns out of the hands of the mentally ill. He said nothing about assault weapons. ..."
I ate Marco Rubio. 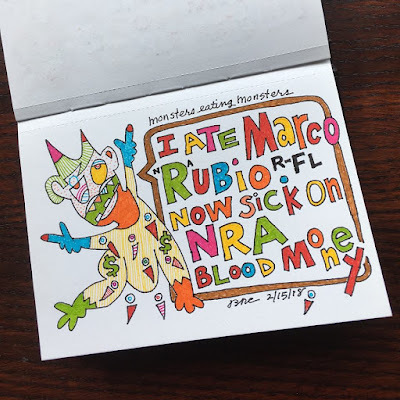 Now sick on NRA blood money. I ate Kellyanne Conway. 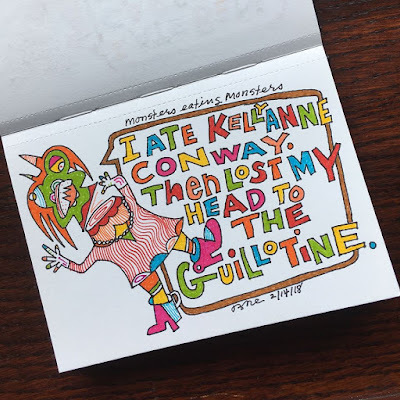 Then lost my head to the guillotine. 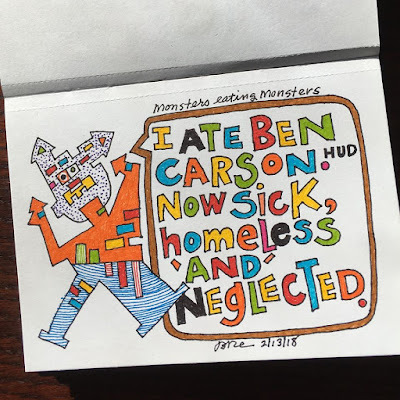 I ate Ben Carson. 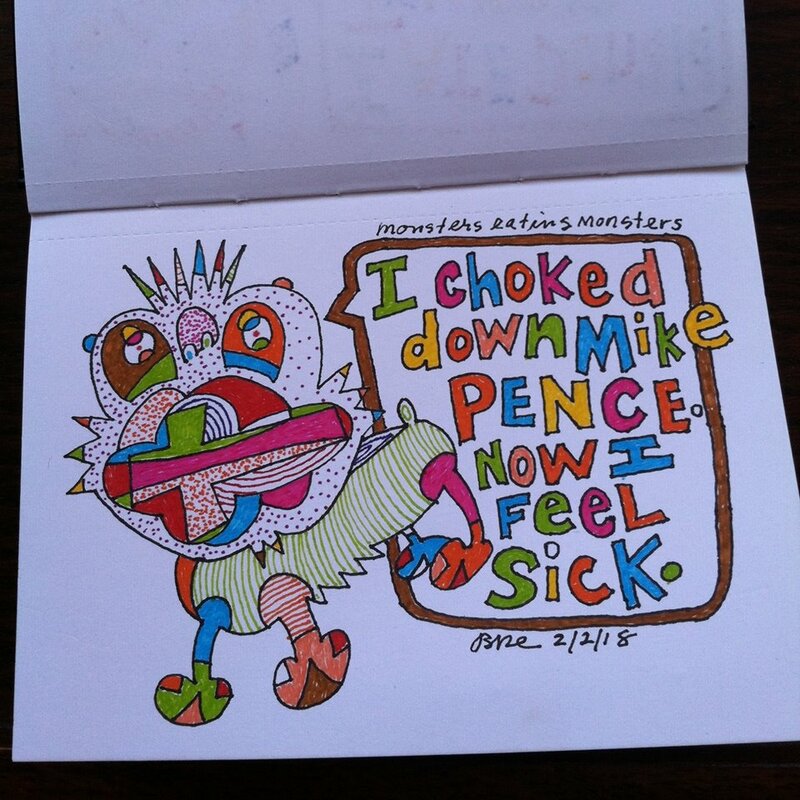 Now sick, homeless and neglected. "... Meanwhile, last year, for the first time since 2010, homelessness levels ticked up nationwide. ..."
I ate Bashar al-Assad. Now farting poison gas. 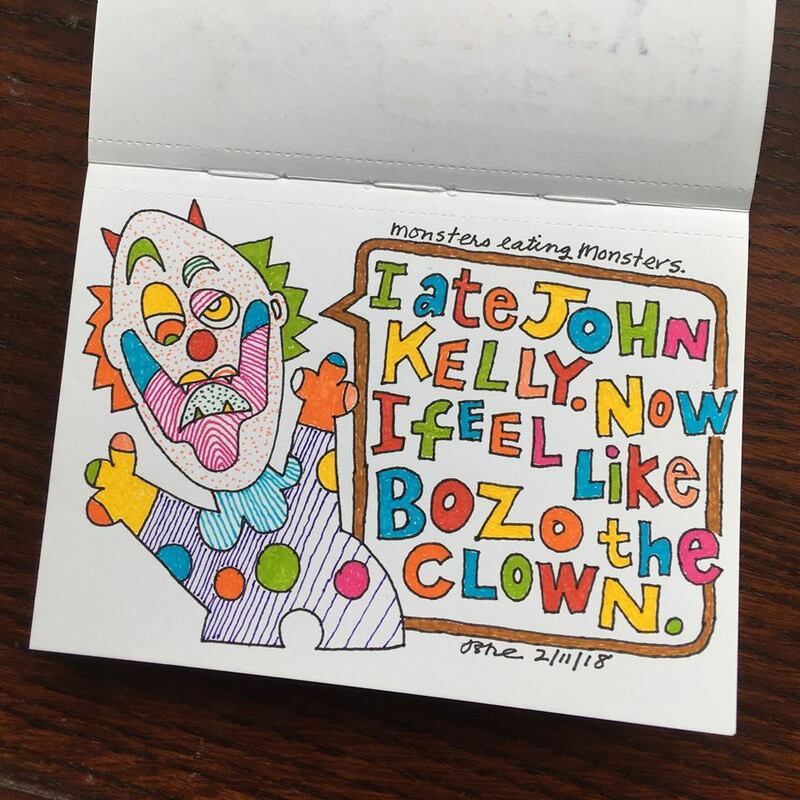 I ate John Kelly. Now I feel like Bozo the clown. "... The mounting days of bad press about the handling of Porter — who knew what and when, the problem with his security clearance — are just the latest in a series of instances of Kelly drawing the wrong kind of attention. 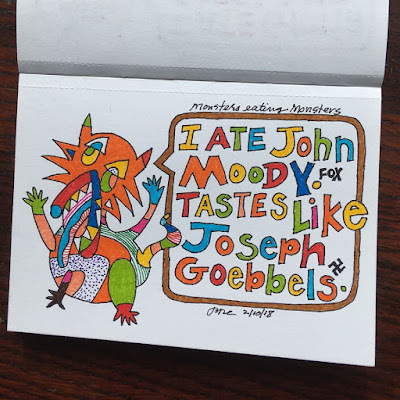 ..."
I ate John Moody. 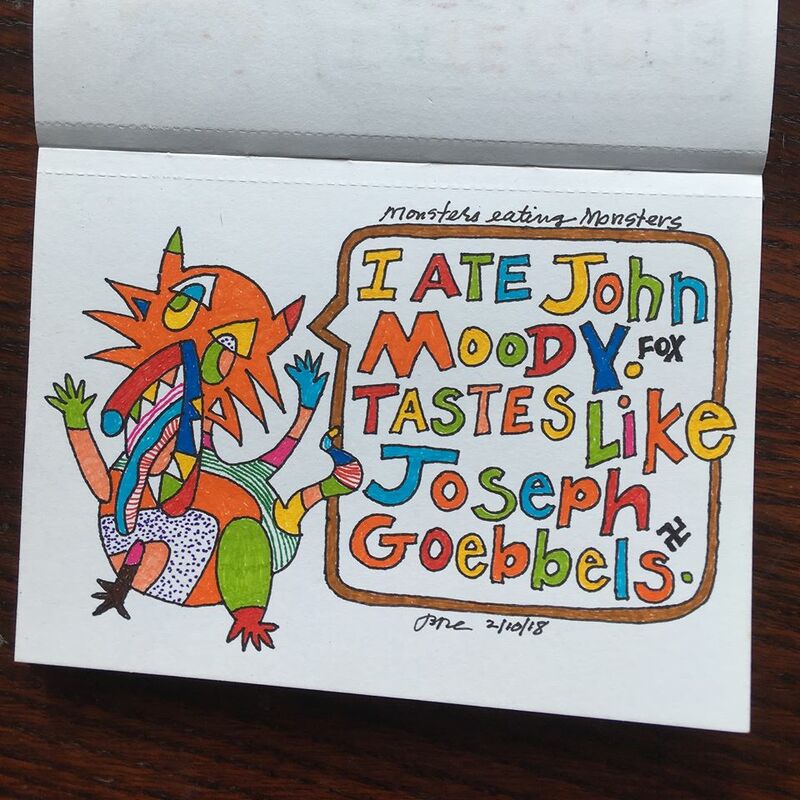 Tastes like Joseph Goebbels. "... @FoxNews pulls http://Foxnews.com/ column by exec vp John Moody, who wrote that U.S. Olympic team's motto should be "Darker, Gayer, Different...If your goal is to win medals, that won’t work.” ..."
I ate Gloria Copeland. 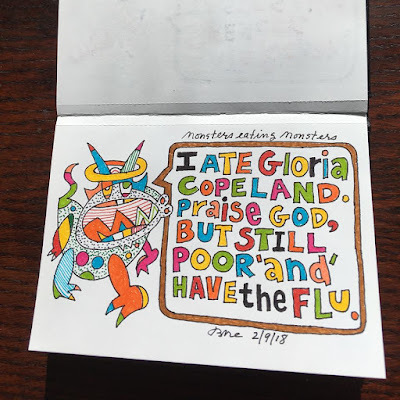 Praise God, but still, poor and have the flu. "... Copeland – who told her viewers in the video that “Jesus himself gave us the flu shot” and “redeemed us from the curse of flu” – has insisted people put their health in God’s hands. ..."
I ate Richard Spencer. 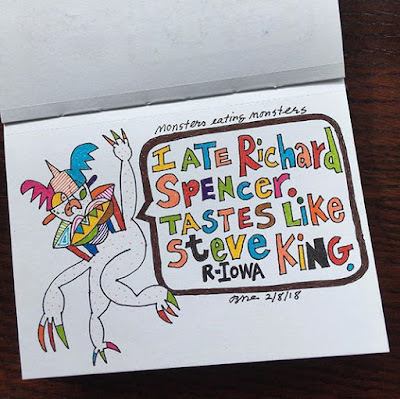 Tastes like Steve King. “We can’t restore our civilization with somebody else’s babies,” Rep. Steve King (R-Iowa), an immigration restrictionist in Congress, said on Twitter last year. ..."
I ate Mac Thornberry. Pooped out Dr. Stangelove. 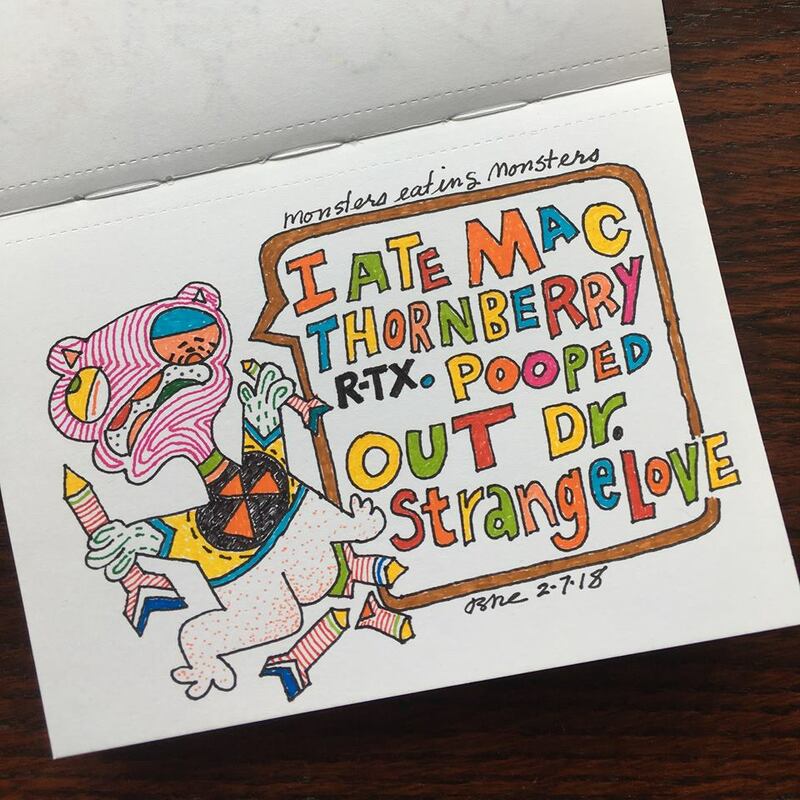 "... Rep. Mac Thornberry (R-Tex. ), chairman of the House Armed Services Committee, echoed the administration’s recommendations to increase the stockpile of “low-yield” nuclear weapons — “tactical” armaments that could still wipe out whole cities — and deploy a number of these warheads in submarines as a sign of American intent. “The U.S. must recognize the reality of a return to great power competition and posture itself accordingly,” he wrote in an op-ed for Defense News. 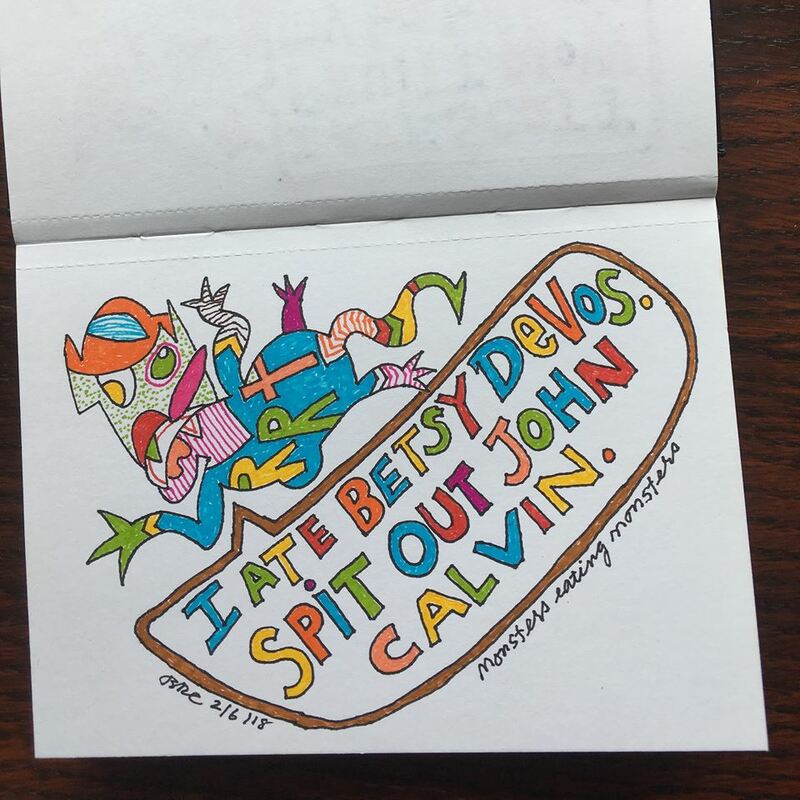 ..."
I ate Betsy DeVos. Spit out John Calvin. "... "It's been a long-standing goal of the Religious Right to replace public education with Christian education," she said. "The long term strategy of how to change culture is through education." ..."
I ate Scott Pruitt. 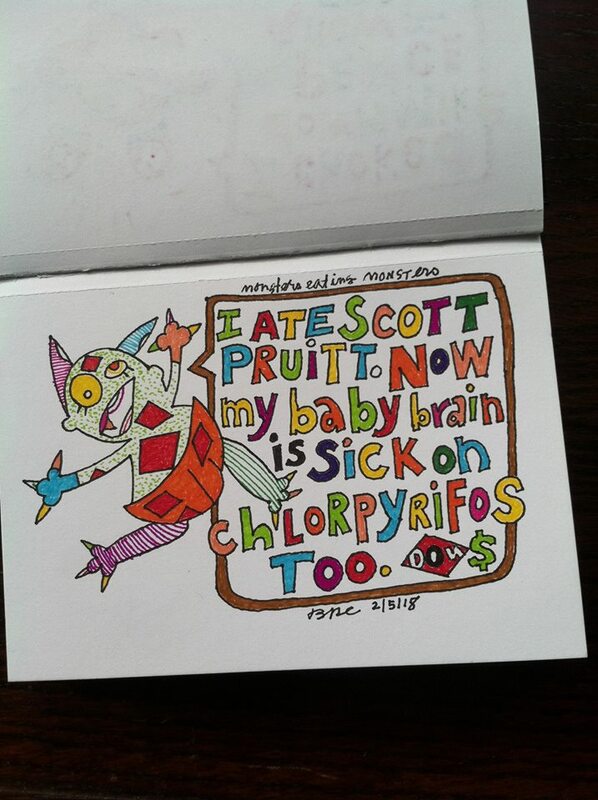 Now my baby brain is sick on chlorpyrifos too. I choked down Mike Pence. Now I feel sick. 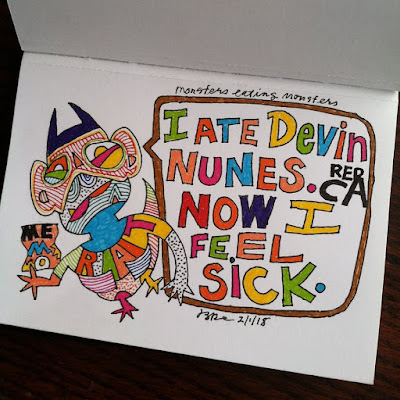 I ate Devin Nunes. Now I feel sick.